✔MEASUREMENTS: Duvet Cover 3pc Set - Full/Queen Duvet Cover 90" x 90" , 2 Pillow Shams 20"x 30". ✔EASY TO CARE FOR: No fade, No shrink and wrinkle resistant. Machine washable in cold, dries quickly on tumble dry low temperature. 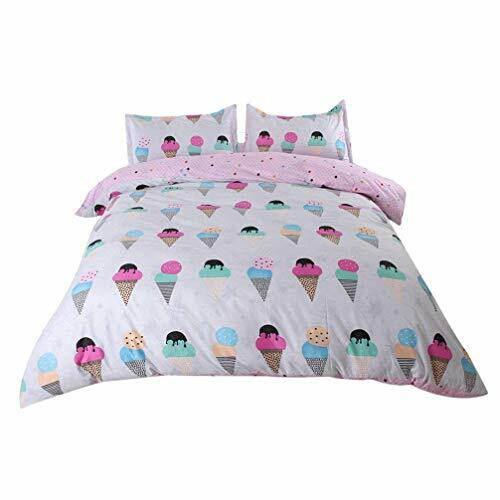 ✔USAGE: The pink ice cream bed Duvet cover sets is a birthday gift for kids,This pink ice cream bedding set suitable for all of seasons. ✔Design: Luxury Cozy Duvet Cover features a hassle free hidden zipper closure,convenient and efficient for cleaning the quilt. ✔SATISFACTION GUARANTEE: If you have any questions within 30 days, please feel free to contact us to return and replace the goods. If you have any questions about this product by Sookie, contact us by completing and submitting the form below. If you are looking for a specif part number, please include it with your message.